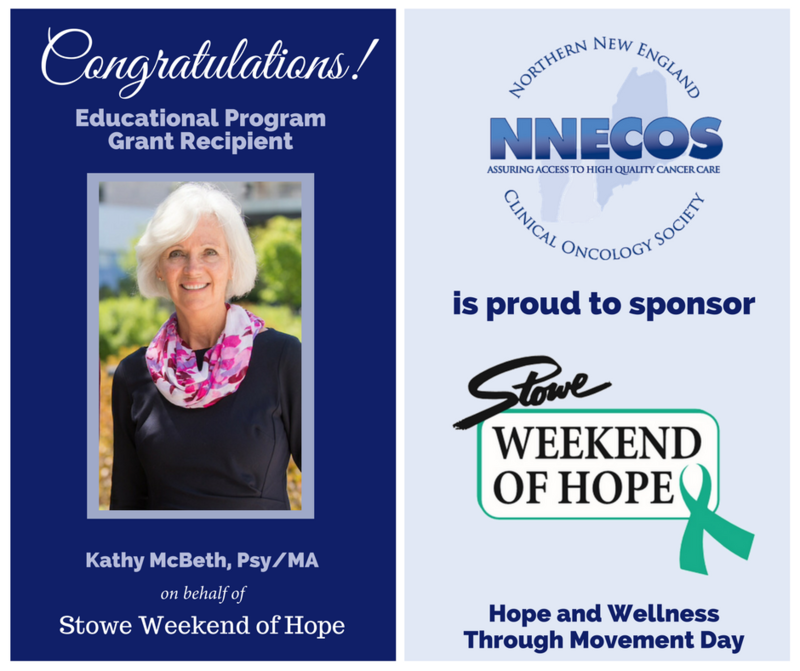 Read the letter from NNECOS Past President Dr. Steven Ades about this exciting new program! 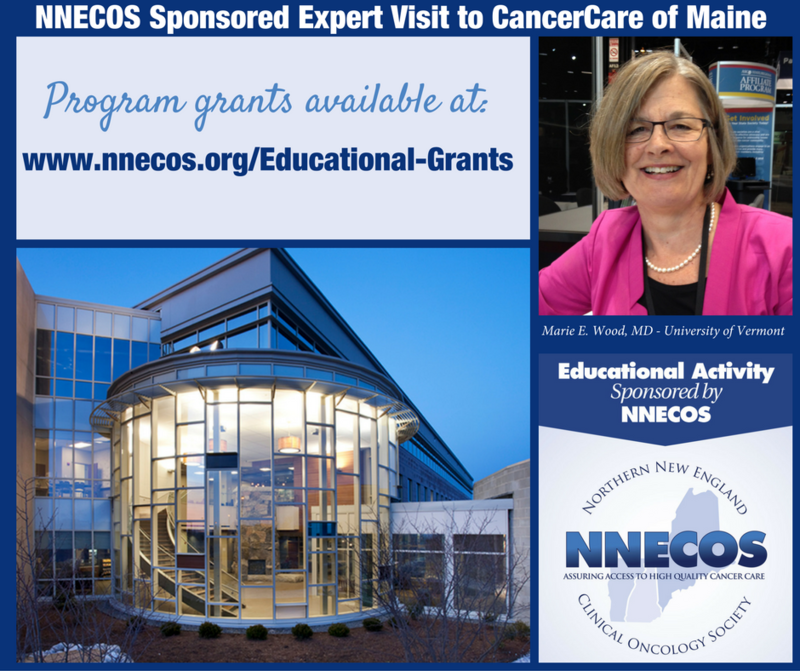 NNECOS will award a limited number of educational grants (typical range between $2,000 and $4,000) in sponsorship of local educational activities. 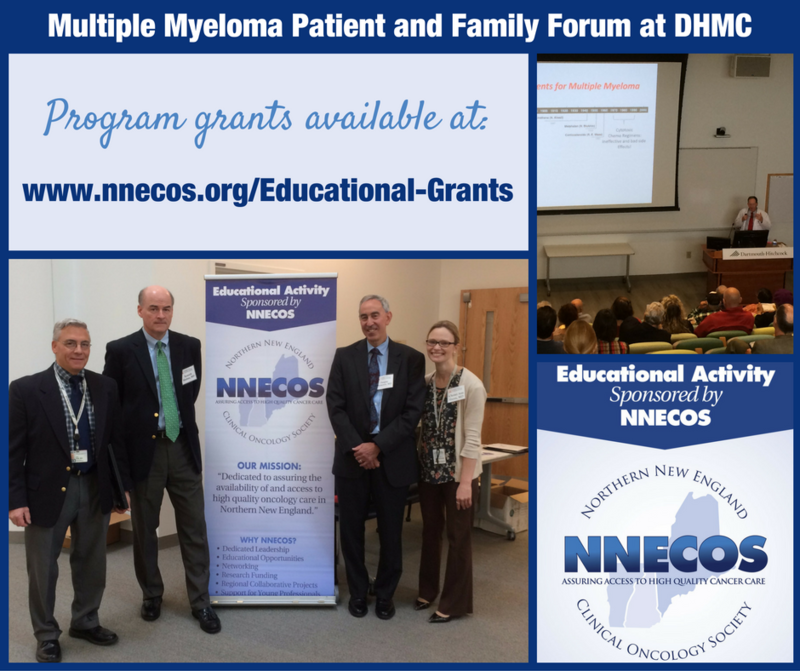 NNECOS will accept requests for applications (RFAs) from NNECOS members to support an educational endeavor (clinician‐focus or patient‐focused) at their practice or institution. These meetings will not be CME‐sponsored. NNECOS will review applications on a rolling basis until available funding has been awarded. Please see our list of available presenters/topics. Provide post-event report/documentation, within 7 days of the event, including a summary of the meeting attendance, budgetary issues, etc. Please consult the online faculty list for topics/suggestions; faculty outside of this list is also acceptable. 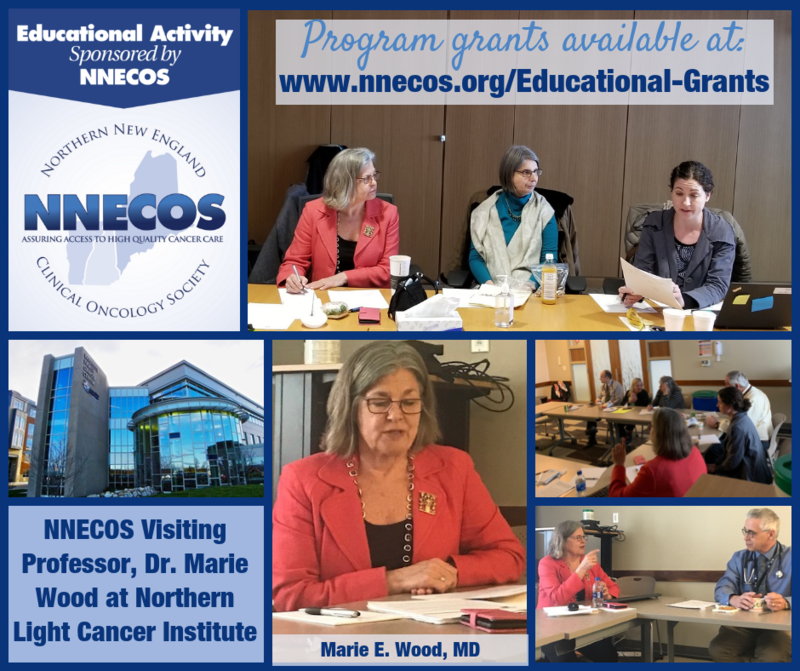 NNECOS President-Elect Dr. Marie Wood was a visiting professor at Northern Light Cancer Institute in Brewer, Maine. During her visit, Dr. Wood participated in tumor board, gave a talk about the genetic evaluation of breast cancer patients, met with physicians for case presentations and led a journal club over lunch. The visit was sponsored by a NNECOS Educational Program Grant. Educational program grants can also be used to sponsor dinner programs. 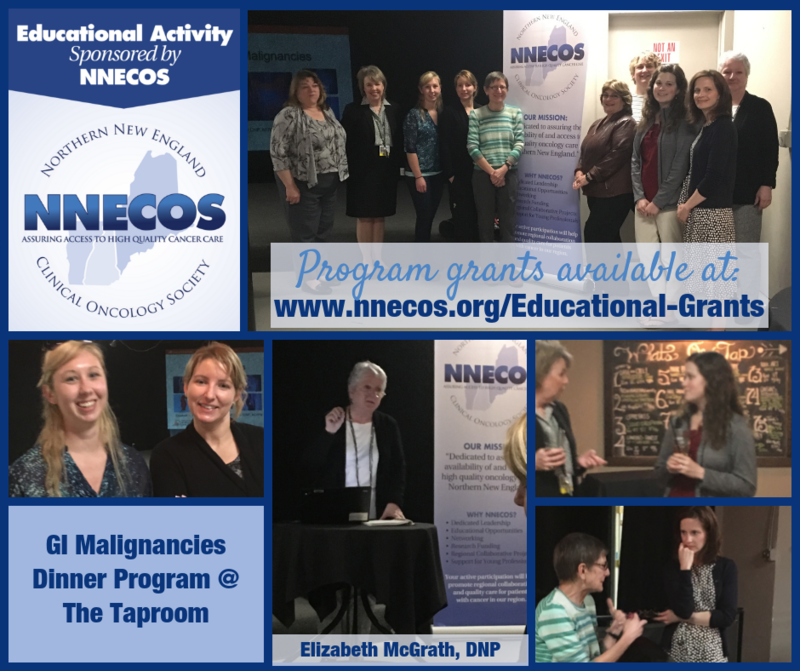 Last spring, NNECOS member Anna Schaal submitted an application for a NNECOS sponsored a GI Malignancies Dinner Program at The Taproom. 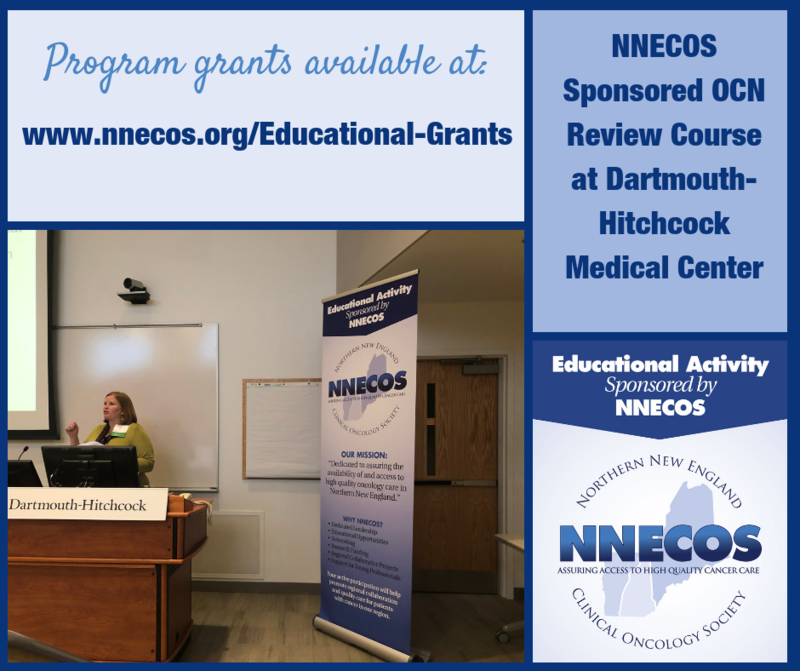 Last fall, a NNECOS co-sponsored OCN Review Course at Dartmouth-Hitchcock Medical Center was hosted thanks to an Educational Program Grant. 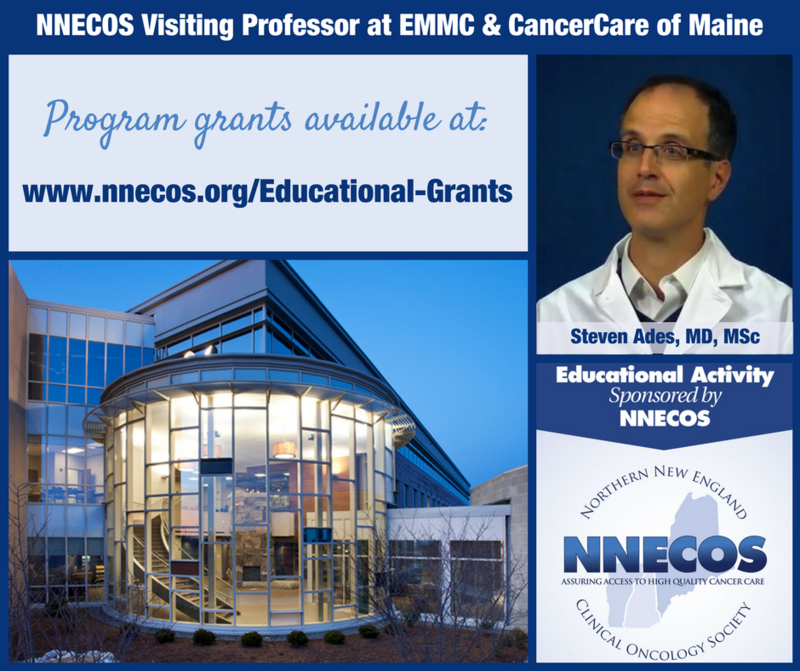 Steven Ades, M.D., M.Sc., Associate Professor of Medicine, Hematology/Oncology Division, The University of Vermont Larner College of Medicine was the NNECOS visiting professor at Eastern Maine Medical Center, Bangor and Cancer Care of Maine, Brewer on April 4, 2018. He began the day by attending the multidisciplinary cancer conference, followed by a talk on ‘new advances in the treatment of metastatic adenocarcinoma of the prostate.’ Dr. Ades also gave a lunchtime seminar on ‘advances in imaging and treatment of oligometastatic adenocarcinoma of the prostate.’ Sessions were attended by the medical, surgical and radiation oncology departments, as well as CCOM nurses, advanced practice nurses and research staff. Dr. Ades’ visit was sponsored by a NNECOS Educational Program Grant.